Our next meeting is the 2018 DADA AGM on Tuesday 13 November 2018, 7pm at 572 Plenty Rd Preston (Cnr Josephine Grove). 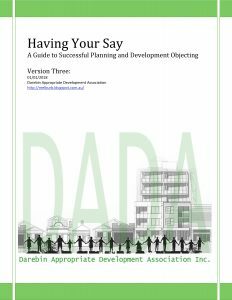 We look forward to seeing as many members as possible and do consider if you take an interest in planning in Darebin and are a DADA member, you may wish to nominate for an Executive role in DADA. We are a volunteer organisation and rely on our members’ participation to function. So you may wish to consider stepping into an Executive role to continue DADA’s great tradition of supporting local people in 2019.